Interesting fact: When you combine all of Tim Colgan’s piloting hours, he has spent more than 2 years of his life in the air. Colgan Air Services was started as Professional Flight Training in June of 1989 in La Crosse, WI. 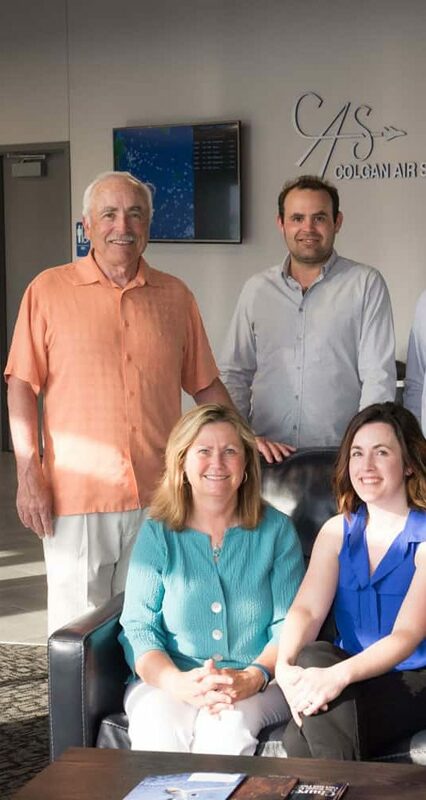 In October 1992, Tim and Debra Colgan purchased the Heileman Air Services building on the southeast side of the La Crosse Municipal Airport and the name was later changed to Colgan Air Services to reflect the change in ownership. Tim Colgan began his career in aviation as a corporate pilot for G. Heileman and was named General Manager of Heileman Air Services. Today, Tim has over 18,000 flight hours flying everything from a Cessna 172 to a Gulfstream 450. In addition, Tim is a FAA check airman and a FAA Designated Pilot Examiner. Debra was the regional accounting manager for Century Telephone Company and is currently the accountant for Colgan Air Services. Tim and Debbie’s, son and daughter, have also joined the family business. Christopher Colgan is the Chief Pilot of the Flight Department, and originally started by working as a Line Service Technician. Christopher has over 4,100 flight hours spending most of his time flying corporate jets. In addition to his extensive aviation ratings, Christopher graduated from Viterbo University with a Bachelor’s Degree in History. Their daughter, Kelly, is the President of Colgan Air, overseeing the day-to-day operations of the FBO. Kelly began her career in Milwaukee working for a nonprofit and obtained her Masters of Science in Nonprofit Management. Kelly later decided to join her family business and continue the success Tim and Debbie had established. In October of 2017, Colgan Air celebrated 25 years of business with the Grand Opening of its new Customer Welcome Center. In June, the building received its first major upgrade in over two decades, with the completion of the 3,240-square-foot addition.The addition boasts floor-to-ceiling windows offering a full view of the runway and the Minnesota bluffs along with comfortable lounge seating, a fireplace, widescreen TV and spacious conference room for press conferences, government visits, meetings and seminars. Colgan Air Services looks forward to serving the aviation community of the Coulee Region for many years to come.